Emergency Response | North American Dismantling Corp.
On Thursday May 8, 2003 at approximately 5:30 pm, a tornado touched down at the General Motors Oklahoma City Assembly Plant in Oklahoma City, Oklahoma creating extensive damage to the Paint Shop, Body Shop, Powerhouse and completely destroying 2 cooling towers. 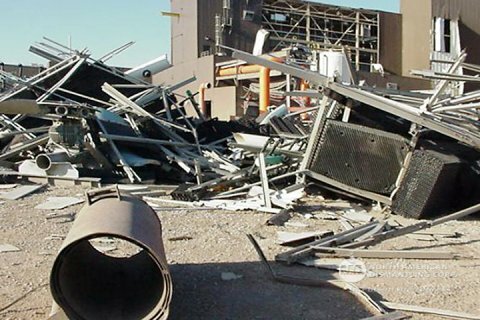 At 10:00 pm on Friday May 9, 2003, one of North American Dismantling’s employees received a phone call at home from Washington Group, GM’s construction managers, requesting North American Dismantling mobilize immediately to assist in the tornado clean up. Of the several 1st tier demolition contractors available, General Motors choose North American Dismantling. North American Dismantling dispatched its key personnel on the next available flight to OKC and joined with the command team in the afternoon of May 10, 2003 to assist in establishing a plan of attack including defining scopes of work and schedules. Within three days, North American Dismantling mobilized 36 major pieces of equipment, including hydraulic excavators, loaders, and 250 ton capacity hydraulic cranes in addition to 150 craftsmen to complete the demolition required prior to new installation. Because of the special permitting required to transport its Caterpillar 345 Ultra High Reach Hydraulic Excavator from Lapeer, Michigan to Oklahoma on a Sunday, it was necessary to contact and receive permission from the Governors of six different States. This piece of equipment was on site within 24 hours after it was requested.